Danny Peterson | 11/7/2017, 4:11 p.m. Momentum is growing for a plan to remake the Rose Quarter district into a fully functioning neighborhood, embracing its diverse past and re-creating a landscape that can accommodate much more than its two sports and entertainment venues. The Rose Quarter is home to the Moda Center, Veteran’s Memorial Coliseum, Interstate 5 and parking garages. Visitors to the area are typically there for 1 or 2 hours to catch an event and then leave, but the land used to be a contiguous part of north and northeast Portland’s street grid system where folks lived, worked and played. The new non-profit group Albina Vision wants to make it a community again. The Albina Vision for the Rose Quarter district is displayed as a fully functioning neighborhood, keeping the sports and entertainment venues, but returning new residential and business-centered blocks. Zari Santner, a retired Portland Parks Bureau director, is one of the volunteers and advocates behind the grass roots plan. 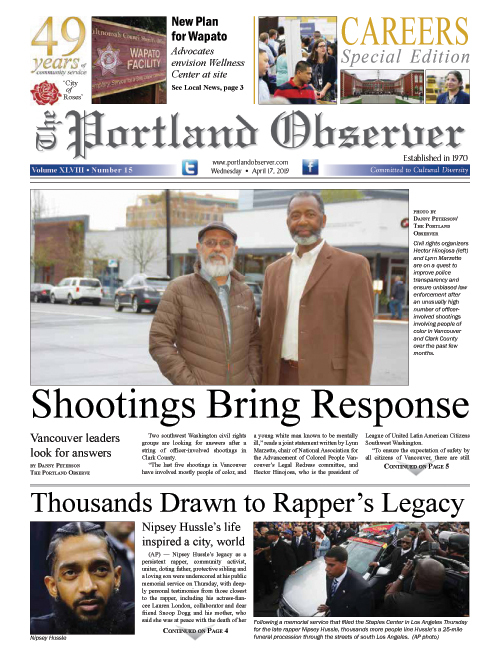 Former Portland Parks Bureau Director Zari Santner and former Urban League of Portland director Michael Alexander are the visionaries behind the idea. They have been friends for over 10 years and worked together when Alexander served as a Parks board member. Now retired, they helped form the Albina Vision organization as civilians. The group’s aim is to have a community driven plan that determines the future development of the Rose Quarter area for the next 50 to 60 years. “We want the community to know about it. We want the community to, if they believe us, to join us to really be part of this happening. That's what it takes,” Santner told the Portland Observer. Albina Vision has created renderings of what the Rose Quarter development could look like. The supporters hope to bring the area back to a more neighborhood-friendly place that can house community gathering spaces, affordable housing, and local businesses. A new waterfront park could resemble Tom McCall Waterfront Park, located across the Willamette River from the Rose Quarter. “We want this place to be truly inclusive, integrated, livable community, and affordable community,” Santner said. Though the current renderings of the area are only ideas, Santner and Alexander said they’ve been met with a lot of support from community members and have so far gotten the ear of Mayor Ted Wheeler and the city council. Before urban renewal and the neighborhood razing actions of the 1960s and 1970s, the Rose Quarter was home to residences, shops, and community gathering spaces. It was the historical neighborhood for African American residents and immigrants. The name “Albina” comes from the town that once legally comprised most of inner north and northeast Portland in the late 19th and early 20th century before it was annexed by the city of Portland. The black population in Albina exploded after World War II, but subsequent displacement from urban renewal dispersed many of the residents. The major property owners of the Rose Quarter area are the city of Portland and Portland Public Schools. When you add the several blocks of property the school district owns on the north side of Broadway it comes to a potential 95-acres of property that could be developed in the area.